Opera Excerpts: Drusilla in Monteverdi's "L'incoronazione di Poppaea," Frasquita in Biet's "Carmen," Zelina in Mozart's "Don Giovanni" and Barbarina in Mozart's "The Marriage of Figaro." Opera Choruses: La Boheme, Ernani. Singing in Sing! A Celebration of the Choral Voice at the English National Opera in the London Coliseum. Operas: Santuzza in Mascagni's "Cavalleria Rusticana" in Italian (see Testimonials) and Violetta in Verdi's "La Traviata" in Italian (see Testimonials). Also Carmen in Bizet's "Carmen" in French (see Testimonials). Opera Excerpts: Elisabetta in Verdi's "Don Carlos." Trio-Soave sia il vento from Mozart's "Cosi fan tutte." Duet with chorus-Brindisi from Verdi's "La Traviata". Solo works include Come Scoglio from Mozart's "Cosi fan tutte" and Dich, theure Halle from Wagner's "Tannhauser." Chorus work in various presentations. Dido in Purcell's "Dido and Aeneas" (see Testimonials); Violetta in Verdi's "La Traviata" in English; Santuzza in Mascagni's "Cavalleria Rusticana" in English and Anna in Verdi's "Nabucco," while understudying Abigail. Royal Albert Hall, London, with Country Wide massed choir. Recorded live--see "Recordings" for CD details. 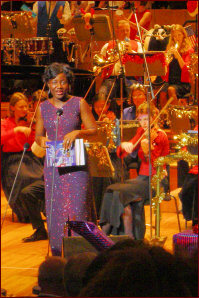 Royal Festival Hall, London, in Christmas Praise with Children's Choir. Recorded live--see "Recordings" for CD details. (see Testimonials). 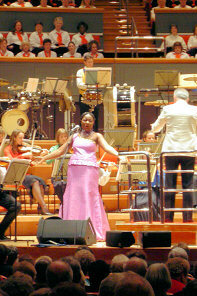 Bridgewater Hall, Manchester with the Manchester Gospel Choir. (see Testimonials). Symphony Hall, Birmingham, with Local Choirs. (see Testimonials). Venue Cymru, Llandudno, including singing Calon Lan in Welsh, with Local Choirs. (see Testimonials). Tour of Northern Ireland in Moved by Compassion in aid of Leprosy Mission NI. in the Waterfront Hall, Belfast, and the Millennium Forum, Londonderry, with Local Choirs. (see Testimonials). Philharmonic Hall, Liverpool, in Prom Praise on Merseyside with Local Choirs. (see Testimonials). St. Andrew's Hall, Norwich, with Local Choirs. (see Testimonials). Victoria Hall, Stoke, with Local Choirs. (see Testimonials). Soloist in Mozart's Requiem (see Testimonials). Soloist in Handel's Messiah (see Testimonials). Soloist in Haydn's Creation (see Testimonials). 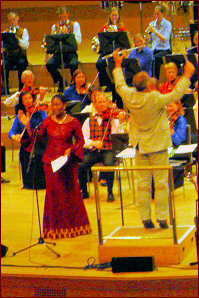 Soloist in African Sanctus in St. John's Smith Square, London, in the presence of the Composer. (For comments from Composer, David Fanshawe, and Conductor, Roy Wales, see Testimonials). Soloist in a Spiritual and Gospel Concert in St. James's Church, Piccadilly, London. (For comment see Roy Wales, Conductor, in Testimonials). Soloist in Henshaw's Carols by Candlelight in Manchester Cathedral. (See comment from Conductor, Andy Silver, in Testimonials). Various other solo, duet and chorus work in many venues, including live and recorded Television and Radio programmes for BBC's Songs of Praise, Sunday Worship and the Daily Service. Also ITV's My Favourite Hymns and live on Granada Report, plus local radio Carol Service. Soloist in Majesty...His Story in London and Leighton Buzzard and The Master's Plan - Millennial Peace in London and Leighton Buzzard. Soloist in Building Bridges - Making Amends. A Bicentenary Commemoration of the Abolition of the African Slave Trade. Soloist at Service of Thanksgiving and Rededication for Dr. Barnardo's. Soloist for Redeeming the Arts in Sale, Cheshire. Soloist at Music at Sine Nomine with Andrew Wilde. (see Testimonials). Soloist in John Rutter's Feel the Spirit with the King Edward Musical Society, Macclesfield, and on recommendation, with the Phoenix Opera Chorus, Stockport. Other companies she has soloed with are Heritage Opera, Macclesfield Oriana Choir, The Philharmonic Choir of Manchester, Bury Choral Society, The East Cheshire Hospice Chorus and others. Also soloist for Dvorak's Stabat Mater, Requiem Mass, and Mass in D, plus Michael Tippet's Child of Our Time. Soloist in the 80th Anniversary Concert celebration for the Macclesfield Oriana Choir. Concert of Western and African Singing and Ghanaian Drumming at St Felix School, Suffolk. 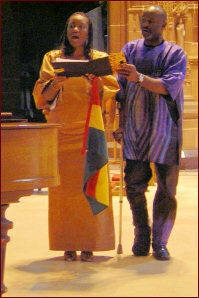 Concert for Ghana Union of Manchester on 48th Independence Day and other functions. 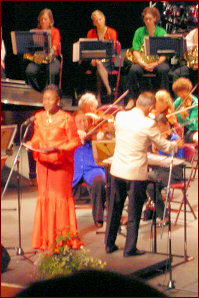 Soloist in Pre Male Voice Choir Festival Concert in Cornwall in 2005 and 2007. (see Testimonials). Soloist in African Sanctus with the Crickhowell Choral Society in Abergavenny, South Wales. (see comment from Composer, David Fanshawe, in Testimonials). Also, African Sanctus with the The Cornerstone Chamber Choir and Instrumental Ensemble in Milton Keynes, Bucks., in the presence of the composer. Solo and chorus work in Gospels and Galaxies for the world premiere of Karl Jenkins work Cosmic Spirals in the Bridgewater Hall, Manchester. (see comment from Karl Jenkins' wife, Carol, in Testimonials).